Enjoying summer fruit has never been easier. 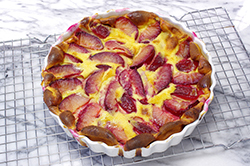 We’ve chosen late summer plums for this dish, but just about any fruit will work, though a traditional clafoutis would feature cherries. 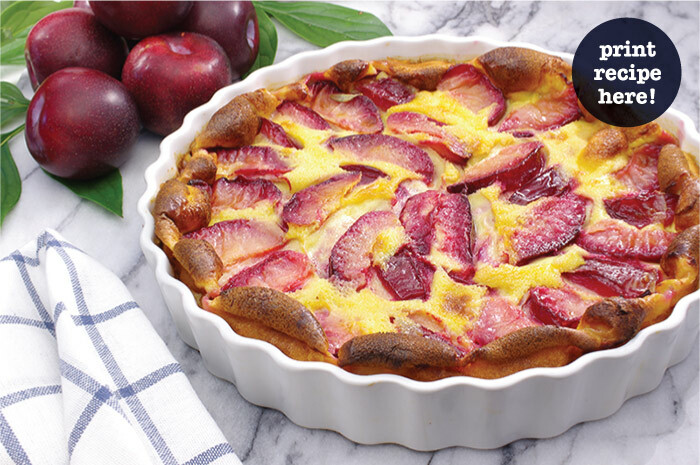 Simply prepare the fruit, place in a pan and cover with a simple batter, bake and serve. The result is similar to a Dutch baby pancake, or a flan, with a slightly custardy likeness. 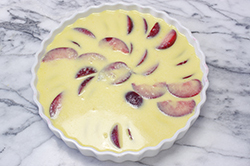 You’ll enjoy the simple elegance of this classic dessert designed for summer fruits! 1 tablespoon powdered sugar for sprinkling on top. 1. Preheat the oven to 375°F. Prepare the tart pan or baking dish by lightly buttering or oiling. 2. Prepare the plums by washing, halving and pitting. (Plum skins are generally tender and smooth, and may be left on. 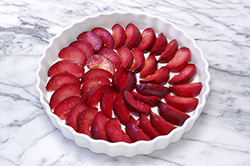 Quarter the plums and arrange in the prepare tart pan. 3. In a small mixing bowl, mix the dry ingredients (flour, sugar, and salt) together. Set aside. 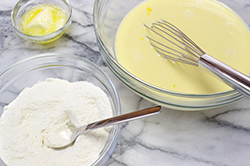 In a medium bowl, whisk together the milk, eggs, melted butter, and vanilla. Add the dry ingredients, and whisk until just combined. 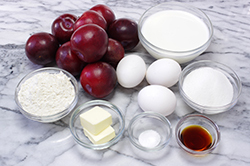 Carefully pour the batter over the plums arranged in the baking dish. 4. Bake for 30-35 minutes, or until a knife placed in the center comes out clean, the clafoutis puffed and the edges browned. 5. Cool until just warm. Dust with powdered sugar. Spoon generous portions of the clafoutis onto individual plates; serve with freshly whipped cream or your favorite vanilla ice cream.